With the passage of time, the Royal Canadian Air Force (RCAF) and the Arctic have become “old friends.” It was a friendship that started out tentatively, with a few exploratory flights during the interwar period, strengthening as the decades rolled by. With the advent of the cold war, the Arctic became very much an RCAF operational theatre. The creation of the North American Air Defence Command (NORAD) spurred the growth of radar sites, forward operating locations for fighter aircraft and the need for permanent establishments such as Alert. These activities were augmented by regular resupply flights, sovereignty patrols and the permanent stationing of 440 Squadron at Yellowknife, Northwest Territories, in 1994. For the RCAF, it is not a matter of returning to the Arctic—we never left.… The Commander of the Air Force has taken steps to ensure that the RCAF continues to be at the forefront of government activity in the Arctic. One of these steps is to encourage the study of our past, gleaning knowledge and recognizing lessons that can be applied to current and future oper­ations. Hence, the need for publications such as De-Icing Required. – from the Foreword by Col J. J. A. M. Cournoyer. P. Whitney Lackenbauer and Major W.A. March (eds. ), De-Icing Required: The Canadian Air Force’s Experience in the Arctic. 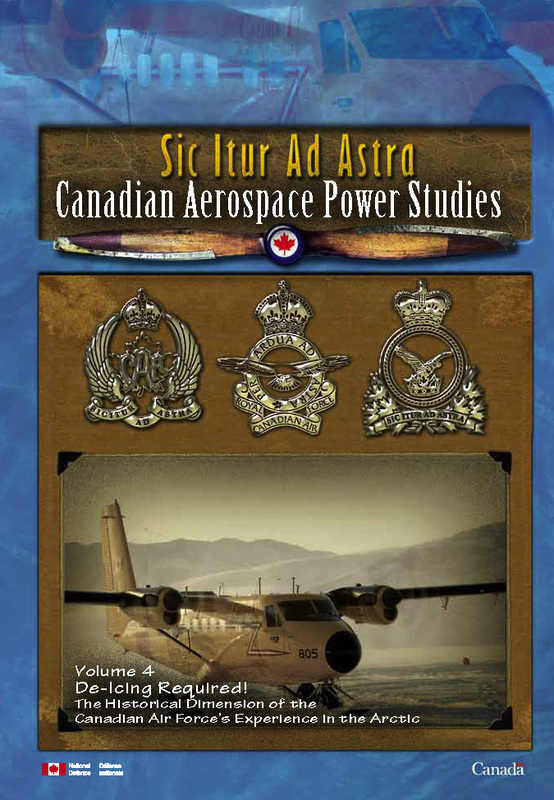 Sic Itur Ad Astra -Canadian Aerospace Power Studies Series No.4 (Trenton: Canadian Forces Air Warfare Centre, 2012). xiv, 151 pp. P. Whitney Lackenbauer de W.A. March (dir.). Dégivrage requis! la dimension historique de l’expérience de la Force aérienne du Canada dans l’Arctique. Sic Itur Ad Astra – études sur la puissance aérospatiale canadienne No.4 (Trenton: Centre de guerre aérospatiale des Forces canadiennes, 2012). xiv, 181 pp. Chapter 1: Air Force: Leader in the Arctic, Ernest Cable. Chapter 2: Constructing a Role: The Royal Canadian Air Force in the Arctic, 1945-1953, Peter Kikkert. Chapter 3: Operation Canon: A Case Study of Early RCAF Arctic SAR Capabilities, Sandy Babcock. Chapter 4: Military Culture and the Mobile Striking Force, Raymond Stouffer. Chapter 5: The Roundel and Building RCAF Arctic “Air Mindedness” During the Early Cold War, Richard Goette. Chapter 6: Inuit-Air Force Relations in the Qikiqtani Region during the Early Cold War, Whitney Lackenbauer and Ryan Shackleton. Chapter 7: Sovereignty For Hire: Civilian Airlift Contractors and the Distant Early Warning (DEW) Line, 1954-1961, Daniel Heidt and P. Whitney Lackenbauer. Chapter 8: Frigid Ambitions: The Venture of the Alert Wireless Station and Lessons Learned for the Canada First Defence Strategy, Rachel Lea Heide. Chapter 9: SITREP: The Morning Light Has Been Extinguished, William P. Sparling. Chapter 10: Arctic Alternative Futures, Daniel Lachance.